The text used is Hero Alexandrinus, Opera ii, ed. by L. Nix and W. Schmidt (Leipzig: Teubner, 1900). I refer to the edition as N&S. And people suppose (wrongly) concerning balances that if weights are in equilibrium with weights then the ratio of the weights is inversely related to the distances. And this should not be stated as an unrestricted claim, but rather it should be better qualified. 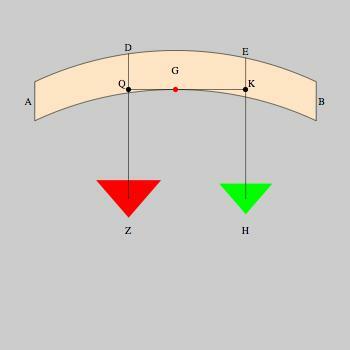 (diagram 1) So let us suppose the beam of a balance as equal in respect of weight and thickness, namely AB, and let its suspension point, namely G, be in the middle of the beam, and (diagram 2) let there hang on points, whatever points they happen to be, namely points D, E, ropes, namely the two ropes DZ, HE, and let us hang on them two weights and let the balance after the hanging of the weight be in equilibrium and (initial diagram= diag. 3) let us imagine the two ropes as going through points Q, K. (If we keep the diagram in N&S,' G' must now designate a point between Q and K) Then while the balance is in equilibrium, as GQ is to GK so is weight H to weight Z. So this is what Archimedes makes clear in his book which is called the Books of Levers. 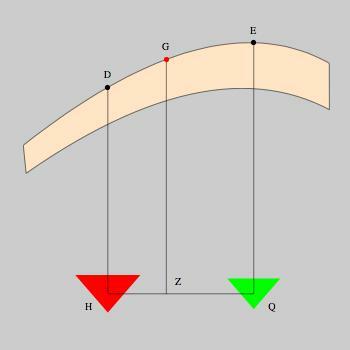 (diagram 4) So if we cut off from the beam of the balance what adjoins the two sections together, I mean, AQ, BK, (diagram 5) then the balance will not be in equilibrium. People think that the inverse proportion <lacuna, persumably, cannot hold where the beam is irregular>. (diagram 1) Let us also suppose the beam of the balance as keeping the weight in equilibrium and as being thick from any body in any part and let there be an equilibrium when it hangs from point G. And our conception of the equilibrium in this case is that the beam would stay at rest and remain fixed even if it tilted to one of the two sides, then (diagram 2) we hang weights at any two points there are, namely E, D and let the beam also be in equilibrium after the hanging of the weights. And so Archimedes proves that the ratio of the weight to the weight in this situation is also inversely as the ratio of the distance to the distance. On the other hand, in bodies that are not regular (orderly), which bend over the distance, here we should suppose in this circumstance the following. (diagram 3) We draw the rope which is from point G to the neighborhood of point Z and (diagram 4) we draw a line and conceive it as going through point Z and as equal to line QH (reading he for mss khe and separating the letters; N&S have ZHQ). (original diagram) And let it be fixed, I mean, if it is at right angles to the rope. (the point seems to be that we jiggle a line equal to HQ until it goes through Z and is perpendicular to GZ and then fix it as in diagram 4. This line, of course will be HZQ) Then when the ropes from points D, E are in this way, I mean, ropes DH, EQ, then the distance which is between line GZ and the weight which is at point E, I mean, ZQ and the weight which is at point D, I mean DH, while the balance is at rest, is such that as ZH is to ZQ so is the weight suspended at point E to the weight suspended at point D. And this was proved previously. Note 1: if this interpretation of i 33 is right, point Z is given without actually being determined, and the rope GZ is hung down to the neighborhood of Z because we are not supposed to know exactly where Z is. Hence, it is unnecessary that DH and EQ hang so that H and Q are level. It is merely necessary that we find a perpendicular through rope GZ connecting DH and EQ. Observe also that HD, GZ, and QE are ropes while HQ is a line. Note 2: It is also interesting that the balance is not uniform in its distribution of weight. However, Archimedes finesses the issue with the initial conditions of the theorem, that the beam balance and that the weights balance. 33 (diagram 1) And let there be a wheel or pulley set in motion on an axle set at A and let its diameter be BG parallel to the horizon, and let us hang on two points B, G two ropes and let them be ZD, GE, and let us hang on them equal weights. 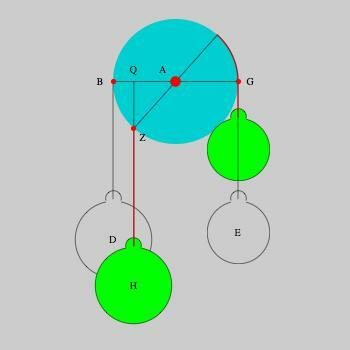 Then it is evident to us that the pulley is not inclining to one of the two sides, because the two weights are equal and the two distances from point A are equal. (diagram 2) Then let the weight which is at D be larger than the weight which is at E. (diagram 3) Then it is evident to us that the pully will incline to side B and sink at B with the weight. Then it is appropriate for us to know that if the larger weight D sinks to any place, it will rest. (diagram 4) Then we make it come to be at point Z. And let rope BD be on rope ZH. Then the weight will rest. Then it is evident to us that rope GE coils up on the edge of the pully and suspends the weight at point G because the part of it that was coiling is not hanging. So we draw ZH to point Q. Then because the weights are balanced, the ratio of the weight to the weight is as the ratio of the distance which is between point A (alaamah for mss. alaaqah) and the ropes. So what AG is to AQ so is the weight which is at H to the weight which is at E. So if we make the ratio of GA to AQ as the ratio of the weight to the weight, and we draw points B, G towards Z, Q at right angles, it is evident to us that the wheel moves from point B to point Z and rests. And this claim also holds for other weights. In this way, it is possible then for every weight to balance a weight smaller than it on this side. Note: The diagram based on N&S, apparently based on Cod. Leidensis 983 Cos. 51 (i) Gol. (cf. into. xxxiii), does not seem to make sense. Suppose the weights are equal, and the wheel is turned so that the weight hangs from a point on the extension of line ZA. (modified diagram for N&S) Let's call this point Z'. It makes no difference whether the rope hangs from Z' or hangs from G with the rope going through a pulley fixed at Z'. The weights will be in equilibrium. However, if the weights are not equal, (diagram unequal weights) then they will not balance until ZAZ' is perpendicular.